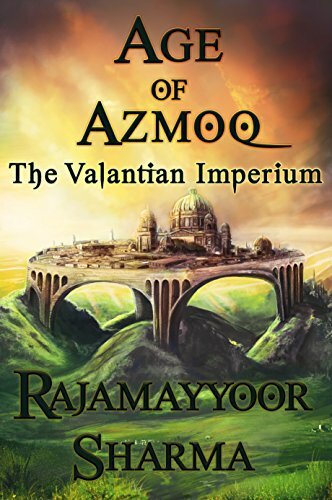 The Age of Azmoq is an epic fantasy novel by the Indian author Rajamayyoor Sharma. This is the first book in the Valantian Imperium trilogy. Before you start reading this book, you must understand the continent of Valantia because this continent makes the backdrop of the novel. The overall setting of the novel, including time and place, is different. For this reason, it is recommended, well in time, kindly see the map of the continent Valentia, and at the end, see the appendix to get knowledge about its military i.e. ‘The Valantian Imperium’ and ‘The Valantian Military’ and so on. As a reader, midway you feel as you are coursing through a book that actually is a military fantasy fiction. Well, there is more to that. The book possesses a question: for what reasons battles are fought for? As we all know, for greed and power and to seize resources like coal, gold, diamond, and lately oil. As the title suggests, Azmoq is a powerful metal and whosoever can procure it and use it in the armory can rule over the world undoubtedly, and one such that kind of army is, ‘The Valantian Army’. So, coming to the setting of the novel, we can say that Valantia is a large continent that comprises of many big countries. Those countries have their armies but that cannot intimidate the Valantian Army. The Valantian Army is the major honcho of all armies. In all senses, this army is invincible. Do they fear anyone? Is it possible that a bunch of people with some magical powers and incredible weapons can bamboozle this army? The story emanates from a tiny village called Villasboro; the village is at isolation from the rest of the world. The people of the village are so naïve and ignorant that they cannot believe that a world outside their village possibly exists. Well, a stranger has been living in that village for some time and people of greater wisdom grow curious to know about him i.e. where did he come from, what’s his name, etc. A young man at the behest of his master is assigned to investigate about him. The stranger expresses his name as Olmot. They both become good friends, but soon Yerin tribe’s assassins attack the village and kill Olmot. Soon it becomes clear that the village Villasboro is not an ordinary village but a mine of metal Azmoq. The ruthless Valantian Army can anytime invade the village for the sake of procuring Azmoq. The young man sets on a journey to avenge the death of his friend Olmot and also to see what lies outside the village. Before his journey, Grim gives him a weapon made of Azmoq. As the journey advances, he is attacked by some soldiers, but then he is saved by a man called Karn. There the young man expresses his name as Dev. Once Karn was a potential soldier of the Valantian military but now he is an outlaw, he is always demanded by the army. Both the young men join hand for their journey. This leads to several events, and not for a moment the plot loses its grip, always tight with action. Afterwards the real fantasy starts, as you read ahead you will find that the book is full of battles and war tales and war heroes. Midway prominent warrior like Elbir and a mysterious girl Kazena also join their gang. As the novel progresses, plot after plot intrigues the readers but it never loses its charm. Another special aspect of the book is that there is no fix villain in the book, from time to time they come and go, like Major Morgan, Azrial and so on, but the major antagonist is the Valantia Imperium itself. Other than saving the village from the clutches of the Valantian Imperium, a sense of rebel against the authority also runs parallel in the story. Those who have seen Hollywood movies like Lord of the Rings series will be able to relate more with this book. This novel too runs like a Hollywood movie, especially who love epic fantasy literature. The language of the book is neither simple nor boring, but it keeps the narrative good going. In fact, the detailed narrative and explanation of characters and their moods and backgrounds may intimidate you but with each chapter you will be amazed to find yourself immersed in the story. All the aspects of storytelling have been covered brilliantly without deflecting from the core of the story. There is something here for every epic fantasy book lover. Rajamayyoor Sharma can be the next star author of India if he continues writing good books like this one.